So, you’ve made it to Loughborough – congratulations! At the University Library we take great pride in how we support all our new users – if you ever have a question about how we can support you, ask one of our friendly staff. As a new student you are automatically enrolled as a member of the Library. your student ID card is also your Library card. Don’t lose it as you need to swipe in through the barriers to enter the Library and to use our self-service machines to borrow your books. Academic Librarians will be out in the schools during induction week – look out for the Library session in your timetable. You don’t have to wait for the session to use us though – feel free to pop in when you arrive and have a look round, or just come along to one of the quick library tours & induction sessions we’re running over the first week of term. During the autumn term Library staff will be running workshops offering helpful guidance on a wide variety of academic practices including essay writing, note taking, time management and presentation skills. You can find more information about these workshops on our webpages. The Library offers an Enquiry Desk Service across all levels of the Library during standard office hours (Monday – Friday 9AM to 5:30PM). User Services staff will be able to help you with most of your enquiries and if necessary will refer you to a colleague with more specialist knowledge. The Enquiry Desks are staffed by a smaller team of Library staff until 10pm on weekdays, and throughout opening hours on Saturday and Sunday. The staff will be able to help you with most of your enquiries but may need to refer you to a daytime member of staff for detailed assistance. For specialised help in finding information in your subject area, each School has its own Academic Librarian to offer support and guidance. Academic librarians are available to assist all University staff and students to find and use information resources effectively, develop library collections to meet your needs and to be your contact point for any information related enquiry. They have all developed expertise in the subject areas of their Schools and are very happy to help. The Library has a range of different study spaces, from silent and quiet spaces to group and social areas. There are also a number of spaces that you can book online including grpup study rooms, bookable booths on Level 4 and individual study carrels on Levels 1 & 2 . Ask at the Enquiry Desk to be shown how to book these rooms yourself. There are 250 PCs (excluding those dedicated to accessing Library Catalogue Plus) available in the Library with the majority of these located on Levels 3 & 4. The Library also has a wireless network throughout the building, enabling users to connect to the University’s network from their laptops. The Library provides basic A4/A3 monochrome and colour printing/copying facilities. Before being able to print or copy you will need to purchase printer credits. You can pay for this at the main Enquiry Desk on Level 3 of the Library. The Student PC Clinic is now situated on Level 3 of the Library and is available to help with any IT queries you may have. It is staffed during standard office hours through until 6PM (Monday – Friday) and is open 12pm-2pm at weekends. We have a café situated on Level 3 which is one of the most popular on campus, not least of all because of their amazing breakfast cobs – as Library staff will testify! We also have a small shop situated near the entrance which sells a variety of snacks, stationary and basic essentials. 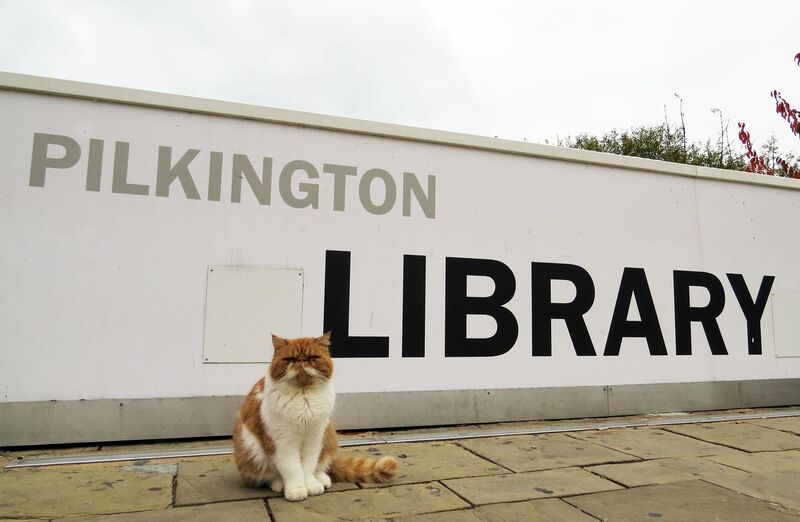 Here at the Library we’re championing leisure reading! Why? Well, not only is reading for pleasure a great mood enhancer, it’s also strongly linked to academic achievement. So, if you want to give your grades a boost, why not come and browse our dedicated Leisure Reading Collection? The Collection comprises a broad range of genres including contemporary fiction, graphic novel, biography, memoir, crime, fantasy, horror and science fiction – something to suit all tastes! … And of course, look out for our favorite feline, Charlie the Cat. Your Loughborough experience isn’t truly complete until you’ve had a selfie with him! This entry was posted in Academic Services Team, Borrowing, Cafe 641, Electronic resources, Leisure Reading, Library, Opening Hours, PC Clinic, Resources, Study spaces by Steven Lake. Bookmark the permalink.